An assertive polemic around first, second and third generations of the same image and the allied implications of that for texture, focus and resolution. 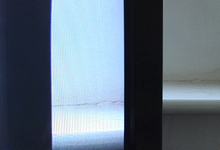 Monitor explores a range of interactions between representation, raster grid, the front glass of the TV and its reflections. These relationships are permutated through focus pulls which shift the interaction between image and raster screen in unexpected and often dramatic ways.